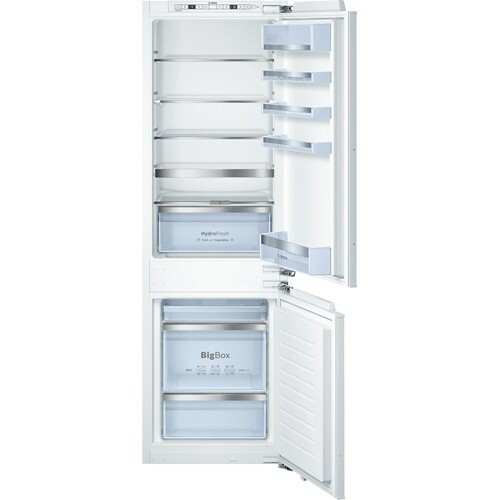 Providing a large refrigeration space with four adjustable shelves, the Bosch KIS86AF30G Fridge Freezer gives you plenty of room to store and organise your food and drink. A VitaFresh box keeps fruit and vegetables vitamin-rich and fresh up to twice as long - thanks to optimum humidity. A handy VarioShelf allows space for bottle and bowls; the sectioned glass shelf can be separated and slid underneath to make room for other goods. Five door balconies provide the perfect space for milk, butter, eggs and other smaller items. The 4-star freezer sports three clear-fronted drawers and a BigBox compartment designed to house larger or awkwardly sized items. The fridge automatically defrosts, while the freezer uses LowFrost technology to reduce the time it takes to defrost by half. FreshSense technology maintains an even temperature throughout the entire fridge interior, keeping foods chilled and full of flavour. This appliance also features SuperCool with automatic deactivation, great for swiftly cooling food to maintain freshness. The fridge-freezer incorporates a high-quality regulating and control technology to ensure a constant temperature, ensuring your food stays fresh for longer. The digital display (via LED) is clear to read and easy to use. The target temperature can be set precisely to the nearest degree from the outside, which guarantees low power consumption and efficient operation and rated at A++ for energy efficiency the KIS86AF30G will save you money on energy bills.